﻿ Contact us - Japanese used parts online shop. Supply Vehicle Spares from Japan. We have a solution to all your needs !! - Japan Parts Online.com A fast and easy way to connect with your dealer directly from your desktop! Get a Free Quotation of New & Used Parts!! Placed an order today and the person taking the order was very professional and very fast. He evn gave me an additional discount. I really like my experience with your company, please keep up the great job! We have a solution to all your Spare parts need. Japan Parts online .com is formed to meet high demands of spares from oversea customers. In recent expansion of used vehicles importation through several online suppliers, Many of customers who imported vehicles might be facing difficulty in finding right spare parts on their imported vehicle from Japan. Our aim is to supply Cheap spare parts from Japan directly to satisfy your spare parts needs easily. Upon receipt of your request on our website, We will quote you various type of spares such as Maker original Genuine parts, Rebuilt parts, Used spares with various method of delivery to your country. We do accept Credit card payment through Paypal service and Telegraphic Transfer into our bank account. Of course, the direct payment for our bank account may be sufficient. We have been dealing major international courier company in the world. ( DHL express, TNT, Fedex, UPS, EMS , Postal sea service , Freight forwrders ) The delivery charge depends on your country and the items what you are after. Our sales will inform you the cheapest delivery method to the fast delivery method for your better decision. The motor parts which are supplied by a maintained merchandise management system from all over Japan. You can contact us through inquiry form or order form on our website. Name of bank : THE BANK OF TOKYO-MITSUBISHI UFJ ,LTD. 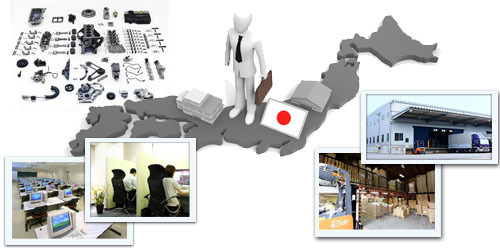 Since established in 2006, We " JapanPARTSonline " have been focusing on how we can gratify customers. Our Long history over 6 years of long experience in this feild of business, we have gather good knowledge on this spare parts trade, and to use our operation, we believe that we have been fulfilling customer's need, and expectation on our spare parts in these days. "Customer's satisfaction is Always No.1" We assure it was accomplished by our Term of professional Sale staffs who all have good knowledge, skills & experience in this car business, and our Assistants who offers help each part of sale's operation, solidity all parts of our staffs with our concerned work shops and related companies around us. As you have already known why customer choose " JapanPARTSonline" by reading above articles. We are yet searching the improvement of our system and operation to give entire satisfaction to our present customers and to our future customers. We shall keep implementing new ideas into our day to day operations, providing quality vehicles, and better service, further and more. Auto Parts Warehouse is always interested in partnering with manufacturers and distributors of high quality affordable parts. Please e-mail service@japanpartsonline.com to contact someone in our purchasing department. If you are interested in advertising your product or service with us, please email us at service@japanpartsonline.com. We accept partner link when you list it please let us know.Please following the step below. Copy and paste "Text tag" or "Banner tag" below. When we got offer we will check your site and list in 5business days. We can list only relevant contents site. Used Cars from Japan -Exporter of used vehicles. We export Toyota etc. Our supplier is Japanese auto auction or a dealers nearby. We stock only with a good quality vehicle. 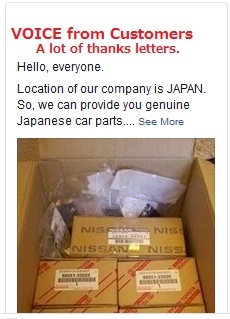 JapanPartsonline.com definitely find your requested spares at the lowest price !! Please fill in the following Inquiry form and kindly send it now. Our Oversea sales will contact you within 24hours. Copyright © 2000-2019 Japan Parts Online.com All rights reserved.